Vodafone Group today announced that it will become Samsung’s exclusive strategic telecoms partner in selected European markets to develop and launch a range of consumer Internet of Things (IoT) ‘Smart Home’ product and services. The “V-Home by Vodafone” suite brings together Samsung’s “SmartThings” open platform and the “V by Vodafone” consumer IoT system (launched in November 2017) to offer consumers simple but powerful home automation, security and safety products and services. The ‘Smart Home’ concept brings advanced telecoms network intelligence to a wide range of consumer devices and appliances in the home to create a new generation of sophisticated security, safety and leisure products. 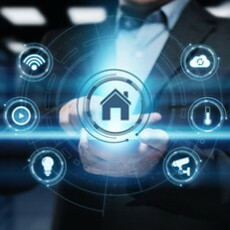 Connected devices such as security cameras, smoke detectors, water leak sensors, smart lighting and smart heating help make properties more secure and energy-efficient. Analysts estimate that by 2020 there will be more than 290 million consumer smart home devices in the countries in which Vodafone operates, up from around 45 million today**. The “V-Home by Vodafone” suite provides immediate alerts to the customer’s smartphone in the event of a home intrusion. It also enables simple remote automation of home appliances and utilities, including voice activation via home voice assistants. “V-Home by Vodafone”, with the Samsung SmartThings Wifi hub will be launched in Spain and Germany in Q2 2018, marking the exclusive European debut of Samsung’s innovative new Smart Home controller as well as the release of Vodafone’s powerful consumer IoT suite focused on protecting and enhancing the home. “V-Home by Vodafone” will be launched in other markets later in the year. SmartThings Security Camera – this compact camera (6.5cm x 6.5cm x 3.35cm) provides high-quality images (at 720p resolution) and has motion detection and built in infra-red for night time. Up to 14 days’ video will be stored in an encrypted “V-Home by Vodafone” personal video cloud. SmartThings Multipurpose Sensor – this 4.8cm x 3.4cm x 1.4cm multipurpose sensor can be placed on a window or door to generate an immediate alert if it is opened or closed unexpectedly, or if left open. It can also monitor changes in room temperature and vibration, sending an alert if the room is too warm or too cold, or if there is a knock on the door. SmartThings Siren – this small (9.5cm x 6.3cm x 3.95cm) but loud (85dB) warning siren is fitted with a strobe light. It will plug into any power socket – and connects to the Samsung SmartThings Wifi hub using the ZigBee wireless protocol. Vodafone ”V-Home Alarm Assistant” – this is a comprehensive alerting service that uses the Vodafone network to send a series of app notifications, SMS messages and automated outgoing phone calls, as necessary, to named contacts (the customer plus nominated others such as family, neighbours and friends) within 15 minutes of an alert being triggered. Vodafone “V-Home Monitor” – the “V-Home Monitor” is the ‘front end’ of the “V-Home by Vodafone” system, with simple set-up via the customer’s smartphone. The “V-Home Monitor” and SmartThings app makes it easy for customers to configure the SmartThings and Vodafone devices and services to undertake a wide range of functions. For example, a baby’s room could be fitted with a camera and room temperature sensor, the front door could be monitored with a camera, ground floor doors and windows could be fitted with movement detectors, and rooms with potential fire hazards such as tumble dryers could be fitted with heat detectors. The range of smart home IoT devices supported under the “V-Home by Vodafone” system will continue to expand through 2018, including additional SmartThings sensors plus smart lighting, thermostats and speakers from third party providers under the “Works with SmartThings” programme. The “V-Home by Vodafone” initial setup is very straightforward, with the customer simply logging into the “V by Vodafone” app on a smartphone then scanning a QR code on the Samsung SmartThings Wifi hub to link the device to the customer’s “V by Vodafone” IoT account. Connected devices such as cameras and sensors are then automatically detected and added to the network. “V-Home by Vodafone” customers will pay a one-off cost for each device or starter kit plus a low, fixed-rate monthly subscription that includes all charges for the Vodafone “V-Home Alarm Assistant” and storage in the”V-Home by Vodafone” video cloud. For Vodafone customers, the monthly subscription is added to their existing Vodafone bill. The post Vodafone and Samsung strategic partnership to launch Smart Home services appeared first on IoT Business News.